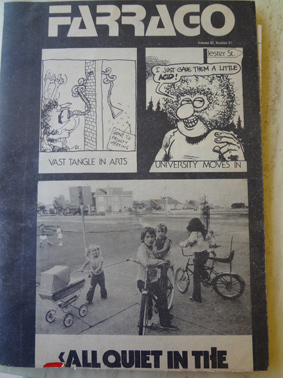 Farrago, the University of Melbourne student newspaper, produced by the students for the students, started in 1925 and changed its system of appointing editors in 1975. The fact that this was the year of the 50th anniversary of the paper’s existence, eluded those of us involved with the paper in that era. And what a FUN ERA it was. The past was history, the future would inevitably be glorious and the present was iridescently, fantastically free. So was university, thanks to Gough the Great. Labor was swept to power, in 1972, under the scintillating mantle of Gough Whitlam’s brilliant mind and personal charisma, driving out tertiary fees and ushering in means tested living allowances, TEAS. This acronym may or may not have stood for Tertiary Education Assistance Scheme. It didn’t matter, we all knew what it meant. Even in the sandstone bastion of privilege that the University of Melbourne was, is and always will be, this was good. Of course, it couldn’t last and didn’t. The nuts and bolts, ins and outs of all this sorry business of good change being overturned is thoroughly covered, along with much, much more in Education and Public Policy in Australia, by Simon Marginson (Cambridge University Press, 1993). When this same Marginson was editor of Farrago in 1973, Anno Gough (AG) 1, the editor was appointed by a vote at SRC (Student Representative Council) level. In 2 AG, Stephen Mills took the reins. Cultivated and urbane, he, like his predecessor, was also not afraid to get political. But because this was in the Fun Era, Mills also used his Farrago power base to secure an interview with Hunter S. Thompson. Politicians and causes come and go but a cultural icon inspires forever. 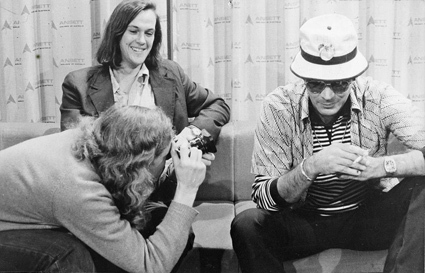 Up close and personal: Stephen Mills interviewing Hunter S. Thompson. 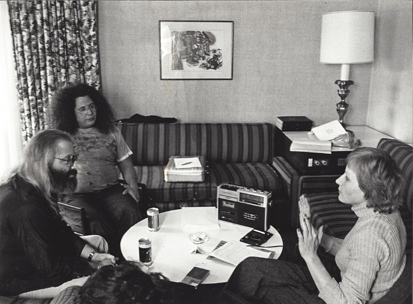 Multi-tasking in the foreground, Sandy Thomas, who had been a draft resister in the pre-Gough years. Yes, yes, there was a serious side to the Fun Era. Even though the Labor government ended conscription and involvement in the Vietnam War, women were still barred from driving trams, law students had to be very careful to avoid arrest at demonstrations, South East Asian students had to cover their heads with paper bags at demonstrations for fear of deadly reprisals back home and hard drug use took its ravaging toll. Someone oughtta write a book about it ! In the mid-70s, Farrago was printed in Shepparton, 180 km from Melbourne. Layout was completed on Thursday nights of publication weeks, then printed for delivery by Friday afternoon. Anyway, then, in AG 3, there were four – four Farrago editors, that is. They were Richard Cooney, Rob Nowak, Imre Salusinszky and Sandy Thomas. This unholy quartet may have been an amalgam of two separate teams, uniting to combine their SRC support and thereby maximise their chances of election. (please see correction below) Whatever, it worked. In practice, the team split neatly in two, with Cooney and Nowak responsible for one fortnightly edition and Salusinszky and Thomas, the other. 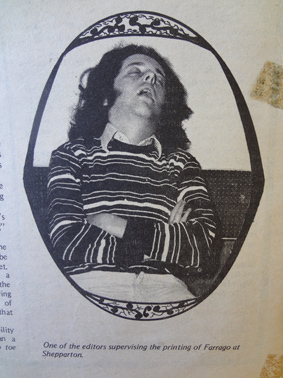 The main excitements of 3 AG, apart from the radical shake-up of the system of selecting new Farrago editors, were the disappearance of Cooney into the Outback and the defection of Salusinszky to National U, the national university paper, as Assistant to the Editor. Cooney, had set off with a friend known as Claudio Claudio and when he failed to return for a very long time, Nowak put a death notice for him in Farrago. This backfired. One of Cooney’s friends who had read it, contacted Cooney’s parents, in her grief, to offer condolences. The laughter was respectfully and briefly silenced in the Fun Era. Cooney eventually reappeared. Never a big talker – in fact, being the chatttering chimp that I am, I often noted his monosyllabic tendencies – he didn’t offer many details of his Outback sojurn. Apparently, the car broke down early in the trip, the travellers parted ways, with Cooney tramping off on his own. At one point, sleeping in a ditch, he awoke to find a dingo staring down at him. When the time came to think about the editorship for 1976, a few likely contenders revealled themselves. They included two formidably serious teams, Colin Golvan and Campbell Smith, in one corner and Blazenka Brysha, Jane Carnegie and Vicki Steer, in the other. Because we were all close colleagues on Farrago and understanding that this would be playing Russian roulette, all parties involved, including, most importantly, the SRC, agreed that it was time for the editorship to go to a public, student body vote. Although I withdrew my candidacy before the election and supported the Carnegie/Steer ticket, I accepted an invitation from Golvan to be their News Editor, if he and Smith won. The year ended on a screeching note with Malevolent Mal knifing Gough. On November 11, 1975, I was sitting a morning exam at the Exhibition Buildings. When it was over and the doors were opened, the blazing sunlight burst upon us, so, too did Sandy Thomas holding up a freshly printed copy of The Herald, announcing the sacking of Whitlam. He called for us to join the march on Melbourne’s Government House. We did, to no avail. The AG years of the Fun Era were over. Farrago had turned 50 and its editors finally had to face the fans. Serendipity for some, bad luck for others. History. Campbell Smith, with Shane Stanley, another Farrago alumnus, stayed in journalism and pioneered the use of automated Apple scripting and Quark Xpress for digital magazine/newspaper production in Australia, in the 1980s. They played a significant part in the establishment of Dance Australia Magazine, founded by Dally Messenger in 1980. Blazenka Brysha proved too unconventional to head the News Desk in 1976, as her headline, “Caf Prices Not Slashed,” showed, and while, like a divorced royal, being allowed to retain her title, she was released back into her natural habitat, the World of the Arts, thrashing out reviews and features. She was Director of Student Publications in 1977 and, as such, the publisher of Farrago, edited that year by Peter Russ and Lindsay Tanner. It was a perfectly uneventful year with no law suits or debacles of any sort. The Fun Era was rapidly fading.